A VISIONARY plan to accelerate the digital future of Australia’s red meat and livestock industry has been launched today. Meat & Livestock Australia has unveiled the ‘Value Chain Digital Strategy’ which will be designed to empower every participant at every point in the value chain through data-driven commercial decision making. MLA will lead the development of the strategy with industry stakeholders to deliver seamless capture, integration and interpretation of the vast and increasing range of data being generated through new technology. By exploring the types of data now emerging from the farm-gate right through to the consumer, the strategy will define ways to accelerate the creation of a user-friendly, integrated data platform that enables more informed and agile decision making by businesses right across the value chain, MLA says. 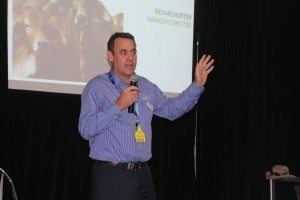 Speaking at the Red Meat Updates conference in Launceston today, MLA managing director Richard Norton said the Value Chain Digital Strategy would harness the multitude of new digital technologies right across the value chain to ensure they work together to build prosperity throughout the red meat industry. “As new disruptive automation and objective measurement technologies emerge and the digital footprint expands, there is an increasing need for an integrated platform that provides more ways for value-chain partners to share and mine data to benefit their business,” Mr Norton said. “There will be increasing use of robotics, drones, driverless vehicles, satellite imagery of pastures, Meat Standards Australia data and compliance, objective measurement and value-based marketing. “At the consumer level, home grocery deliveries, provenance, branded products and ethical consumer purchasing will also make an increasing impact,” he said. The Value Chain Digital Strategy would start to coordinate all of the activity going on, driving the development of an integrated platform for capturing the data and the generation of reliable and objective information tools that can be readily applied within businesses across the value chain. 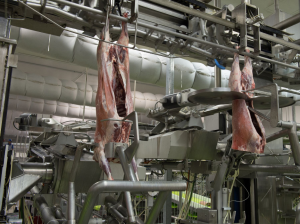 Robotic lamb processing in JBS Australia’s Bordertown, SA plant. Data captured from scanning technologies used in the process will be included in the new value chain digital strategy. Mr Norton said MLA was well-placed to lead the development of a digital strategy, which would require close collaboration across industry with the world’s best innovation companies. “In servicing the entire red meat and livestock value chain, we’re in a position to lead the development of a digital strategy that maximises the opportunity to exchange information and produce what our markets need more sustainably and profitably,” Mr Norton said. Mr Norton said the need for a whole-of-industry digital strategy in the Australian red meat and livestock industry was compelling. “While our industry enjoys significant natural advantages, increasing competition within our domestic and export markets – and input costs that are consistently higher than all of our major international competitors – mean it is imperative for our industry to work smarter,” he said. Mr Norton said MLA had strategically engaged in seven Rural R&D for Profit projects, six Cooperative Research Centres and three consortiums within the red meat and broader agriculture sectors. “These partnerships will ensure the development of a digital strategy platform suitable for mixed production and processing businesses – and the involvement of global companies, universities and other research and development providers in the value chain digital strategy,” he said. MLA recently secured a $4.8 million Australian Government grant for a collaborative project to develop advanced new live animal and carcase measurement technology that will pave the way for value based pricing. “This transformational project is just one pillar of our value chain digital strategy,” he said. MLA’s adventurous Livestock Datalink project, launched in May last year, will be one of the tools that will be part of the overall value chain digital strategy. “The Value Chain Digital Strategy is meant to be overarching across the industry – so it will pull together and co-ordinate the digital advances already being seen across industry like Datalink, which can now fall under the strategy,” a spokesman told Sheep Central.